The Entry History is used to keep a record of all creations, movements, and modifications of the Entries created within the Pleasant Password Server. 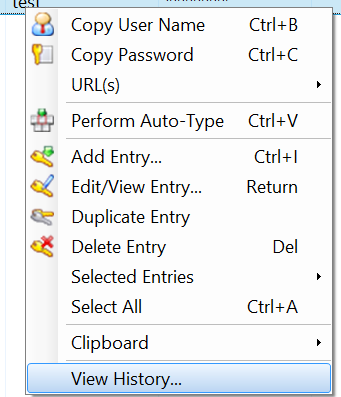 Web Client > Home screen > View of an Entry list > Right-click an Entry > Select "History"
KeePass For Pleasant Password Server > Right-click an Entry > Select "View History..."
A user requires the View Entry History permission (in Access Levels), for the History menu option to be enabled. Each row represents a change or set of changes to the Entry. If you change just the password of an Entry, a single History row will be added. The Entry History table stores each state of the Entry as it is created and modified, and so allows users to view all the versions that exist since creation. To view the actions or events that occurred to cause the changes, or that occurred from one version to the other, refer to the Logging Events page in the Web Admin Client. Note: the Restore function is not available from the KeePass for Pleasant client. You will be able to view all the applicable entry data at that given state. In the above example, at the selected row, it can be seen that the Entry Title was changed from "Demo Entry" to "Demo Entries". The Logging page would give greater details on who changed it and what actions were performed. You can use the Date Modified information to assist you in navigating the logs and finding when the Entry was altered. For a further explaination click the link for information on the Restore Button. User Access permissions, and some other settings remain constant no matter what version the Entry is restored to. Changes are tracked in an Entry's history for: User Access, Notification and Required Comment settings. However, consistency and security purposes, these are not affected by restoring the Entry from history. Restoring an entry will not move it back to its previous location. While Entry History does keep track of when and where entries are moved to and from, it does not tell you this information in the Entry History. Once an Entry has been deleted, History will no longer be available, and so the Entry cannot be restored by this method. See Other Recovery Options.